Thank you for your interest in Circular Breathing Mastery. Please bookmark this page so you can return to it. Registration for circular breathing mastery is $247. Each class blends in-depth training, exercises, practice regiments and multifarious approaches to get to the goals of didgeridoo playing including: holding sonic space, playing with compelling rhythm and tone, circular breathing, and rhythmic playing. This format is designed to help you understand at a deep level how to move your playing forward by quantum leaps instead of by incremental steps. Expect to be challenged and supported as we guide you to create a plan of action for your development as a didgeridoo player. We made over 20 videos covering our circular breathing method content so that you have visual instruction and close-ups of every technique. 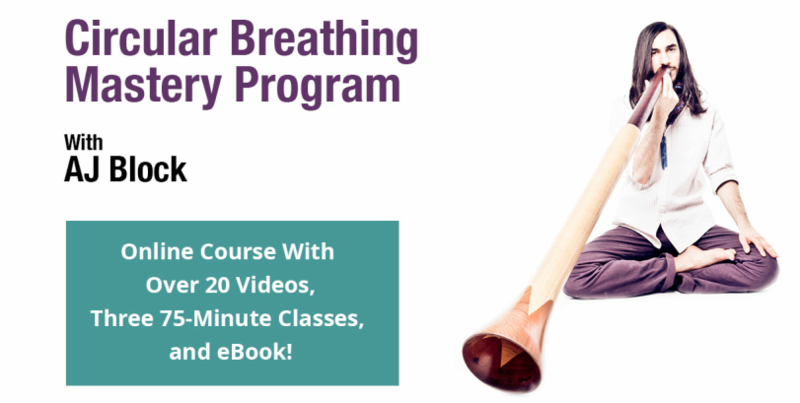 Registration for Circular Breathing Mastery Online is $247.